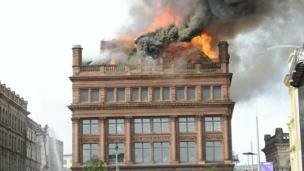 A selection of photos of the fire at the Bank Buildings. 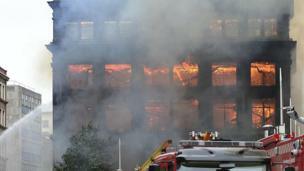 A police officer at the scene has told the BBC that the building is at "risk of imminent collapse". 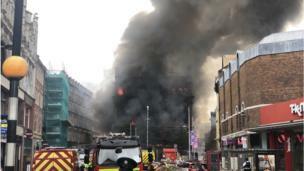 Up to 100 firefighters have been at the scene and the fire service has said the blaze has spread to all floors. 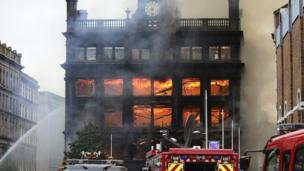 Flames billow from the Primark store in the Bank Buildings on Castle Street, in Belfast city centre. 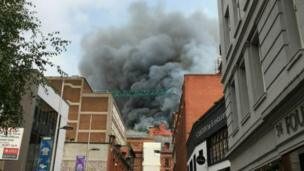 The fire on the building's roof was reported at about 11:00 BST. Pieces of debris have been falling from the side of the building. 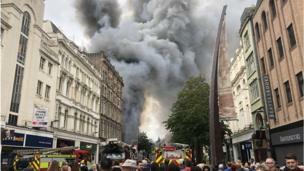 Primark said the store was safely evacuated and there have been no reports of any injuries. 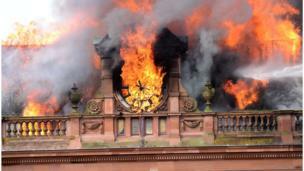 The building's iconic clock was engulfed in flames. 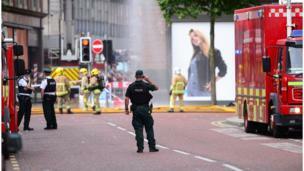 Emergency services have been tackling the fire in Belfast city centre since late morning. 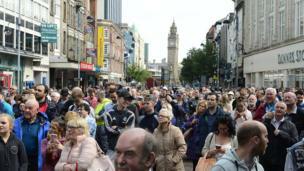 Crowds watched on in astonishment as the blaze spread throughout the building in Belfast city centre. 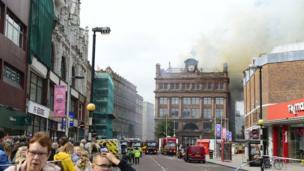 The building was evacuated and Royal Avenue cordoned off as the fire spread.